Home » Blogs » 7GenGames » What Is an Accelerator? People in the tech startup world take for granted the idea that everyone knows what an accelerator is – but this post is a nod to the fact that the vast majority of people probably have no idea what that means. But I recognize this, so when I tell people we’re in an accelerator, I then ask, “Are you familiar with the whole accelerator thing?” Because a lot of people aren’t. Which is the whole point of this blog. We got back late Thursday night (technically, early Friday morning) from Salt Lake City, where 7 Generation Games is participating in the BoomStartup EdTech accelerator. 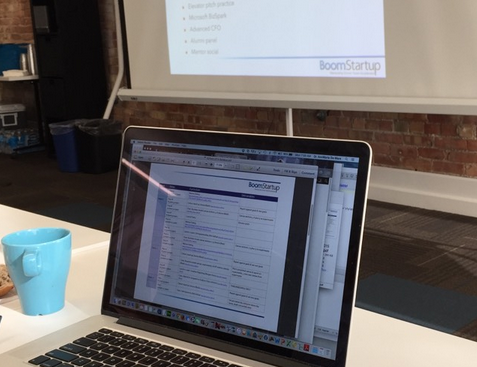 BoomStartup is one of the top accelerator programs in the world, and this particular session (cohort is the technical term) is focusing on educational technology companies. According the BoomStartup orientation, there are over 5,500 accelerator programs operating worldwide – but only 10 of those focus specifically on edtech. It’s a give-and-get because most accelerator programs take equity as part of your involvement, meaning you give them 6 percent of your company (that seems to be the standard). But there’s a value in that because then the program has a vested interest in seeing your company succeed. The common refrain from accelerator programs is that in 12 weeks, you grow your business by two years. And two weeks into one, the 7 Generation Games founders (including myself) totally see how that happens. This is what a hockey-stick graph looks like. My take (which is not the be-all-end-all, but I think pretty reflective of consensus) is that accelerators are not programs for people that merely have “ideas.” They are for people who have actual products and businesses that have the potential to scale (business-speak for get really big) – but need a push to get them to that next level, to the point where they are poised to blow up (in a good way, as in the opposite of implode) or even better to push them up that hockey-stick curve (sorry, I’m really trying to be anti-buzzword, but that refers to business growth being like a hockey stick, kind of slow, but sloping upward at first and then shooting straight up – see the picture to the right). At 7 Generation Games, we feel like we’re exactly at that spot – which is why this accelerator opportunity came at a perfect time for us. We’re at a place where we’ve got a pretty great product – products, actually – now we need to take it to the next level. We need to get people using them. We need to get schools buying them. We need to figure out how to take this from big idea to big company. A good accelerator will help a company do just that.